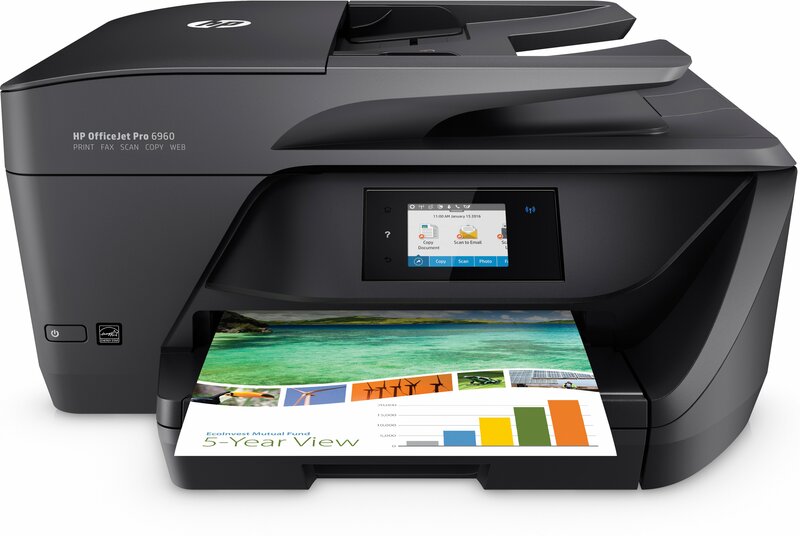 This HP Officejet Pro 6960 all-in-one inkjet printer from HP would be a great option for small offices (no more than five users) or alternatively for anyone who regularly works from home. Its small footprint makes it ideal for any small work spaces or offices where space is at a premium or for a home office where you don’t want your all-in-one printer taking up too much space. Considering the specs of this machine it also offers great value for money with printing, copying, scanning and faxing all available, and automatic document feed (ADF) as standard. The HP Officejet Pro 6960 is certainly a little too big for casual home users, but small business, home office workers, or small offices with up to five users will find it perfectly satisfactory. The HP Officejet Pro 6960 also looks good, with a chic all-black finish, 2.6in colour touchscreen and smooth curved design that makes it appear less bulky than some its predecessors or current competition. The printer measures 20.3 x 18.2 x 9in and weighs approximately 8.05kg. This printer produces professional level results, especially when printing black and white documents and offers great connectivity options, helping you future proof your office or workspace. With this printer, you can expect to print straight from your smartphone or tablet, no matter how far from your printer you are, using Apple Air Print or Google Cloud Print. The HP Officejet Pro 6960 also has automatic duplex printing as standard so that you can help cut down on printing costs while also reducing your environmental footprint. The print resolution is 1200 x 600dpi and the HP Officejet Pro 6960 offers a print speed of 29ppm in black and white and 20ppm for colour. When being used for copying or scanning the HP Officejet Pro 6960 printer works quite slowly which can be frustrating and is a little difficult to set up if you’re a casual user.